HOMEPeterborough Mayor and MP open the Avicenna Clinic! Peterborough Mayor and MP open the Avicenna Clinic! 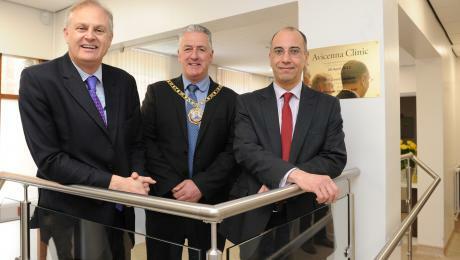 The Mayor of Peterborough, councillor David Sanders, and city MP Stewart Jackson have officially opened Avicenna Clinic – a private healthcare clinic in Peterborough city centre. Avicenna Clinic(www.avicennaclinic.com) is an independent, consultant-led private healthcare practice offering a range of services including diagnostics and imaging, private GP services, minimally invasive surgery and other advanced treatment types. The newly renovated and purpose-built clinic is conveniently located in the centre of Peterborough and incorporates state-of-the-art technology and treatment facilities. Being the first clinic in the area to have an Open MRI scanneris just one example of the way it will be using the latest technology to aid the provision of personalised, flexible and responsive care for its patients. Dr Hany Elmadbouh, radiologist and founder of Avicenna Clinic, said: “The Open MRI scanner is ideal for claustrophobic patients because it does not have the ‘tunnel like’ scanning area associated with conventional MRI machines. Larger patients may also benefit from the less confined space. “Our investment in such technology also allows us to offer a ‘one stop service’ where diagnosis and initiation of treatment can be undertaken in a single visit rather than a series of appointments. This means a much more flexible and convenient service for patients designed to lessen the overall waiting times and stress related to waiting for results that can often stretch over several days or weeks.